Wide Sky Design provides specialist production, development and installation of interactive digital exhibits, AV systems, mobile and web apps for the museums and heritage sector. 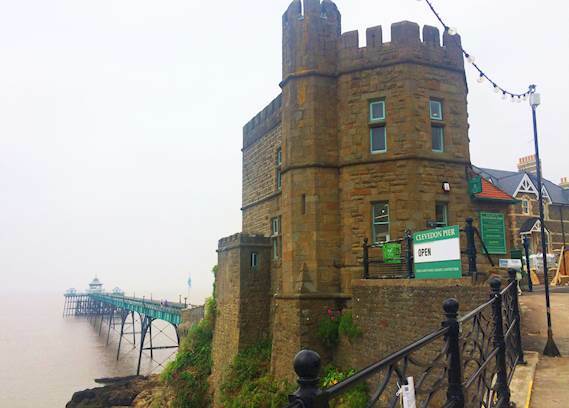 Challenge: Clevedon Pier and Heritage Trust wanted to create immersive and engaging experiences within some unusual and restricted spaces at its new visitor centre in the pier’s Toll House. Solution: Wide Sky Design installed a range of technology. Its ‘SeeWall’ exhibit is driven by a content management system and uses an Optoma W505 projector with a short throw lens within the tight space. The ‘Eye of the Storm’ exhibit employs immersive audio and video, using an ultra short throw projector to wrap original video around the visitor to envelope them in the storm. Clevedon Pier and Heritage Trust wanted to create immersive and engaging experiences for visitors within some unusual and restricted spaces at its new visitor centre in the pier’s Toll House. It needed to get a big ‘bang for its buck’ by ensuring the exhibits would not only have high visitor appeal but would also make the building attractive as a public space that can be used for events. The visitor centre interprets the history of the pier, described by Sir John Betjeman as “the most beautiful pier in England”, the history of the town of Cleveland, and the context of the wider area of the Severn Estuary and Bristol Channel. Of a total of nine exhibits, two called for projection facilities that would give powerful impact in small spaces. 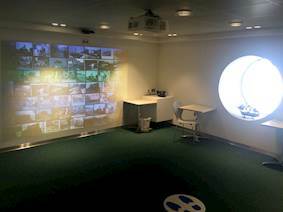 Wide Sky Design installed a range of technology to create an immersive experience within the Porthole Room at the visitor centre. The ‘SeeWall’ exhibit takes Wide Sky Design’s gesture wall concept to create an immersive experience that draws on images and videos of the pier and its surrounding area. Driven by a content management system, this exhibit allows visitors to begin their exploration through physical interaction with the ‘SeeWall’. Because the space within the visitor centre is quite limited, an Optoma W505 projector with short throw lens was the best choice, creating impact with a three metre wide image at short range. 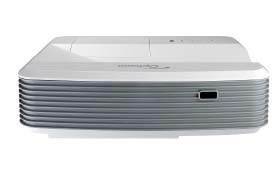 The WXGA resolution W505 projector boasts a brightness of 5,200 lumens and delivers spectacular image quality. Space is even more restricted for a second exhibit which uses video of the storm of 1990, a notable point in Clevedon’s more recent history. Housed in a tower on the corner of the Toll House, this exhibit creates the experience of being in the eye of the storm in an area just 1.5m x 1.3m in floor space. The exhibit employs immersive audio and video, using an Optoma EH320UST ultra short throw unit to project original video on the surface of the tower’s interior wall, wrapping around the visitor and enveloping them in the storm. At 4,000 lumens the EH320UST is one of the brightest ultra-short throw projectors on the market, making it perfect for this bright space. Its Full HD resolution and ultra-short throw lens create a huge vivid picture from very close to the screen eliminating any shadows cast from visitors. 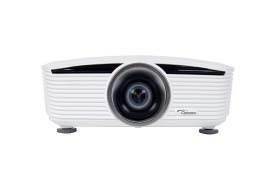 Both projectors are engineered with DLP® technology, pioneered by Texas Instruments. The dust-sealed, filter free design prevents dust and dirt from affecting the system ensuring optimal image quality with minimal maintenance and ultimate reliability. The ‘SeeWall’ is not only a great visitor attraction, it also supports the pier’s other activities. This exhibit is highly appealing to younger visitors making it an essential part of the Clevedon Pier and Heritage Trust’s educational and outreach work for schools as they encourage educational visits. Because the exhibit draws on a flexible content management system, the media displayed can be adapted to different educational themes. The ‘SeeWall’ is also an integral part of the pier’s appeal as a venue for events and functions. 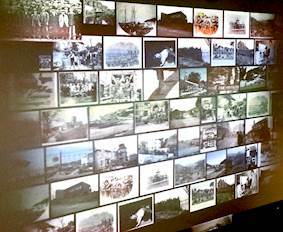 Because the technology can also draw on media from a USB stick, the wall can be used to display content relevant to the event, enhancing and personalising the experience.